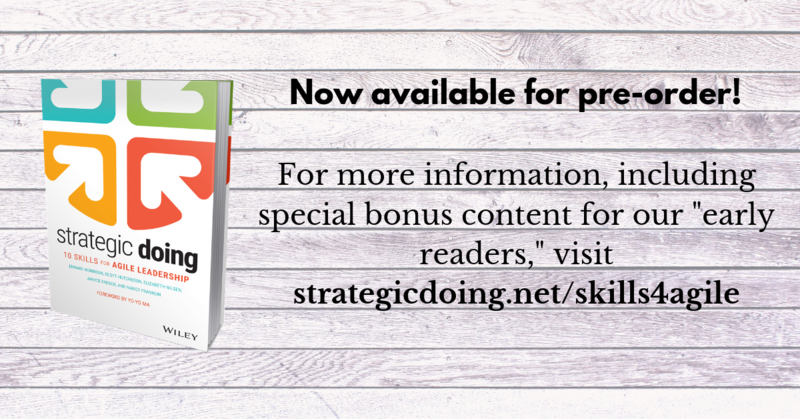 The developer of Strategic Doing, Ed Morrison, has been urged many times over the years to write a book about Strategic Doing. There have been a few starts made at it, but it wasn’t until we started teaching the discipline that the organization of such a book became clear. A team coalesced to take on the writing, we had a set of writing retreats to get the bulk of the writing done, and on May 7, it will begin shipping. We’ve put together a set of “freebies” for those who pre-order a book. If you’re in business of collaborative leadership, or can see the need for those skills coming to your organization or community (and honestly, where aren’t those skills important?) jump to the front of the line for the book by pre-ordering. You’ll get the freebies immediately, and on the 7th, will have the book in your hands (right now, only the hardcover is available for pre-order, although the e-book isn’t far behind, we’re told by Wiley, our publisher). In addition to the links on the book page, we’re told that the book is also available for pre-order in the UK and Australia. Let us know if you need help finding a way to order. ← The book countdown is on…one week!